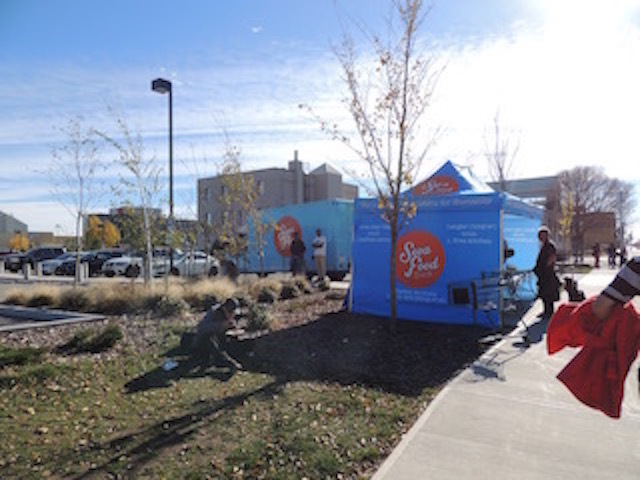 Image of the Seva Food Truck. Photograph by Amrita Gill 2015. Jessy Nerval, 19 at the time, sat in the family room with his Father after dinner. They were discussing business. At the time, food trucks were gaining popularity. Nerval proposed the idea of bring langar (free kitchen) from the Gurdwaras’ (Sikh Temple) basements to the homeless and impoverished. Nerval’s Father encouraged his son to turn this dream into reality. Nerval was working for his family’s business and continues to do so, had been attending MacEwan University, majoring in Business Management. Feeling dispassionate about his current route, he dropped out of school, using evenings after work to build Seva Food Truck – the name, Seva Food Truck comes from the word seva means selfless service. Seva Food Truck – a community based charity initiative started by Nerval and spearheaded by the Sikh Community of Edmonton was running at full speed by 2014. Langar (free kitchen) didn’t begin as a mobile four-wheeler food truck. The origins of langar started with Guru Nanak Dev, the founder and first Guru of Sikhism in 1481. The vision was simple and still holds today: building of community, inclusiveness and oneness between people through the sharing of meals. Even today, a person can enjoy a meal at the Gurdwara and now at the Seva Food Truck, regardless of religion, race, creed, gender, age, ability, or social status. It is encouraged that Sikhs either do seva in the Gurdwara and/or wider community, with the focus on serving without the thought of reward or personal benefit. Nerval is a member of the 19,555 Sikhs residing in Edmonton, with the first Sikhs having arrived in 1904 in British Columbia. As immigration laws relaxed in the 1960-70’s, the largest growth of Sikh immigrants was experienced in all parts of Canada including Edmonton, where most Sikhs arrived as Teachers, International Students, and for work in Alberta’s agricultural and oil industries. Before 1977, when Gurdwara Singh Sabha, the first Gurdwara in Edmonton was located in a west end church and then relocated in 1986 to Millwoods, the sikh community would bring food from home and gather at each other’s houses to enjoy langar on Sundays. Later they also rented a basement room in the Students Union Building at the University of Alberta on Sundays. Thirty nine years later, a total of four Gurdwaras in all areas of the city serve langar available throughout the day to all Edmontonians. Mill Woods Gurdwara 2606 Mill Woods Road East, circa 1997. Image courtesy of the City of Edmonton Archives EA-596-197. Langar is front-and-centre during Vaisakhi, the Punjab Harvest Festival, in April where fragrant, spicy colourful food lines the streets of Millwoods Road. Like Nerval’s Food Truck, langar has Sikhs and non-Sikhs joining together over langar and community conversations. With colourful outfits and floats, It is easy to spot the procession of people walking from Gurdwara Singh Sabha on Millwoods Road South to Gurdwara Millwoods on Millwoods Road East (the route interchanges start and end points each year). The food doesn’t stop there, like Nerval’s Seva Truck, Gurdwara Singh Sabha has done it’s part of food insecurity in Edmonton; with 4 tonnes of food donated and $75,013 going towards the Edmonton Food Bank in 2009 and donations continue till this day. Image of the Seva Food Truck and volunteers. Photograph by Amrita Gill 2015. The Seva Food Truck volunteers have held sixty-one successful langars to date through the Guru Nanak’s Free Kitchen and Pay It Forward program at Spruce Avenue School (Junior High). Guru Nanak’s Free Kitchen, named after the founder of Sikhism and the first Guru, has served simple, nutritious meals out of a tent every Saturday afternoon since May 2015 in at 10535-96 St, across the street from the Bissell Center. The future home of Guru Nanak’s Free Kitchen is at 10919-97 Street, which will soon be home to a brand new building in April/May 2016, built by Nerval Construction and heavily sponsored by the greater community at large, with the continued goal of serving meals to Edmontonians facing issues of food insecurity and poverty. Nerval has had to make some difficult choices when it comes to menu options. His voice sounds heavy, recalling the decision to stop serving Coke, which some were using as chase for alcoholic drinks. He maintains the Sikh principal that “langar is supposed to be simple and healthy, like cholay (chickpeas) and chal (rice), dal (lentils) and roti (flat bread).” As we are talking, a man mouthing down a spoonful of rice and chickpeas, says, “Jessy this is great. Wow. How are you?” Jessy warmly extends his hand and asks if everything is going well. Long sentences are exchanged and it seems as if they have known each other for a lifetime. A plate of food served at the Seva Food Truck. Photograph by Amrita Gill 2015. He speaks excitedly about sharing lunch with the children, “we not only serve meals, but we share them with our children. We have conversations with our children in an effort to provide them with the mentors that are so dearly needed when faced with hardships at a young age. Our aim is to simply create a positive change in our children’s lives, so they may do the same for others.” Nerval is putting action-into-words; in January of 2016, children from Spruce Avenue School (where Seva Food Truck will continue to provide langar), will go to Calder Elementary School and serve langar. He told me he is now keeping his hair (one of the tenets of Sikhism) and tying a turban, a trademark image of Sikh. He feels a renewed sense of his Sikh identity and a strong desire for the wider community to recognize him as such. Nerval is clear and confident in the overarching goal of Seva Food Truck and its longstanding roots in Sikhism, he reminds me, “langar was meant to be eaten as equals, regardless of caste, race, religion, or any other sort of societal divisions. It was meant to enhance the vitality of the individual and the community”. Guided by Guru Nanak Dev’s values and principles, the Seva Truck team continues to breathe life into Edmonton’s community, helping those facing food insecurity and poverty through small, everyday actions. Statistics Canada. 2013. Edmonton, CY, Alberta (Code 4811061) (table). National Household Survey (NHS) Profile. 2011 National Household Survey. Statistics Canada Catalogue no. 99-004-XWE. Ottawa. Released September 11, 2013. http://www12.statcan.gc.ca/nhs-enm/2011/dp-pd/prof/index.cfm?Lang=E (accessed January 4, 2016). Amrita Gill is an educator, community connector, writer & daughter of first generation immigrant parents from a military and law family in Punjab.